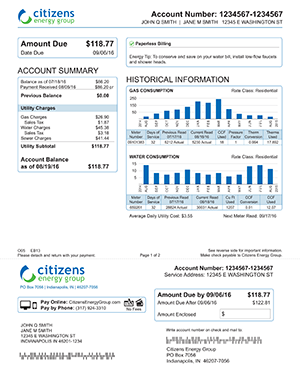 INDIANAPOLIS- Citizens Energy Group customers will soon begin receiving a new and improved bill. Citizens began rolling out its new bill format last week; every customer should have a new bill by mid-December. The new bill format is a direct result of customer feedback. Through phone and email surveys, face-to-face interactions with customers and focus groups, we received feedback indicating modifying our bill format would increase customer satisfaction. Among the improvements, the new bill displays charges in an easy-to-understand format and makes it easier to understand key drivers for charges and consumption. A comprehensive Historical Information Graph illustrates gas and water consumption over the last 13 months. By including 13 months of data, customers can compare current usage to last month and last year, which makes it easier for customers to identify an issue with their service, like a potential water leak. We also make it clear that Citizens is offering more no fee options which make paying a bill easier than before. The back of the bill highlights important contact information for Connect2Help 211 or 811 Call Before You Dig. And, a new Frequently Asked Questions section is tailored to each bill type. Putting Citizens ahead of the curve in the utility industry is the new option to receive your bill in Spanish. In early 2017, when the second phase of the new bill format is rolled out, customers wanting to receive a Spanish bill will simply check a box on the back of their pay stub indicating their desire for this option. For more information about the new bill format and to watch a video explaining all of its benefits, visit CitizensEnergyGroup.com/mybill.